When you talk about horse racing in the United States, thoroughbred races like the Preakness Stakes and the Kentucky Derby probably spring to mind. You might also think about legendary racetracks like Belmont Park, Yonkers Raceway and Churchill Downs or remember famous U.S. horses like Secretariat and Man o' War. Despite this rich heritage and the continued popularity of horse racing in the United States, it is surprisingly hard to place a bet on a horse race from your smartphone if you live in America. Major U.S. friendly sportsbooks like 5Dimes and Heritage Sports do not allow punters to place bets from Android or iOS devices. 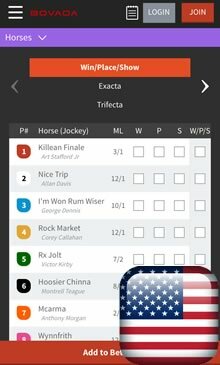 Thankfully that is starting to change as racebook apps for smartphones and tablets are finally being released that allow U.S. citizens to wager on horse races. Bovada are probably the biggest brand in sports betting for U.S. citizens. They have a reputation for paying their customers quickly and have a very high credit card acceptance rate. The Bovada racebook app for iOS, Windows Phone & Droid is ONLY available in the USA. Wager on horse racing from the United States, Australia, UK, Ireland, South Africa etc. Bet types include Win/Show/Place, Trifecta, Exacta, Quinella, Superfecta and more. Get a 3% rebate on your straight bets and get a 5% rebate on all your exotic wagers. Make free deposits and withdrawals using bitcoin or use traditional banking methods. Quickly wager on an upcoming horse race with the "Next 5 Races" feature. Futures betting available on the Kentucky Derby, Gold Cup, Arc de Triompheetc. Citizens of the United States of America who want to wager on a horse from their iPhone, HTC or Samsung Galaxy have had very few options until now. Thankfully, Bovada have upgraded their sportsbook app to include a racebook that offers lines from USA, UK, Irish and Australian racetracks. ​The US horse racing industry has several world-renowned races on its annual calendar, with the Kentucky Derby, Breeders’ Cup and Belmont States just a few of the select choices. Star horses regularly grace the turf across the country’s various racetracks, including the likes of Arrogate, Songbird and the recently retired California Chrome, accompanied by world-class jockeys such as Javier Castellano, Mike Smith and Victor Espinoza. Along with the stars of the turf and compelling racing action comes a thriving betting industry, filled with a plethora of betting markets and an assortment of horse racing betting apps for iOS and Android users. Whether betting on their iPhone, iPad, Samsung Galaxy, Windows Phone or other mobile device, bettors based in the United States and across North America have more variety and money-making opportunity through mobile apps than ever. For US bettors who like to wager on thoroughbreds, there are a host of apps that can help them find value amon the various runners in each race. One example is Equibase, available on iOS and Android and packed with helpful form study features. This includes comprehensive results charts of past races as well as replays for every North American thoroughbred racetrack. It is also a sound option for getting on-the-go information about upcoming races, including the latest odds and final list of runners. Just like Equibase, Horse Races Now brings the racing action straight to the user’s mobile device, dedicating much of their service to broadcasting live racing action and race replays. Live video and audio is streamed directly to the app from a host of participating racetracks in the United States and across North America, with replays appearing almost immediately after the conclusion of each race. Users can also choose to customize the app for quick access to footage from specific racetracks featuring their favourite horses and jockeys. For those that prefer to have the leg work of form study done for them, numerous horse racing tipping services have hit the market, complete with Android and iOS-compatible apps that can send notifications about the hottest tips straight to your mobile device. Free Horse Racing Picks and Tips is among the most popular apps in this category, offering thorough statistics, analysis and predictions, including a daily quick tips feature and recommendations on exotic wagers such as exactas and trifectas. As well as vital information tools for savvy bettors, horse racing apps are often the preferred platform on which wagers are made in the United States. Leading bookmakers such as BetAmerica provide a legal and secure method of wagering through their apps, which feature a wide range of betting markets on both day-to-day racing across the United States and more prominent events such as the Preakness Stakes and American Oaks. Standard win, place or show wagers can me made through this app, as can more exotic options such as superfectas, daily doubles and pick 3s. Rival bookmaker Twinspires, owned by the world-famous Churchill Downs racetrack and known as the official Kentucky Derby betting app, also has several strong features to lure bettors to its wagering platform. Live streaming and video highlights are among them, complemented by in-depth statistics and handicap information conveniently delivered through notifications. A host of ever-changing bonuses and promotions are also available, which is a marketing strategy also employed by Xpressbet, another notable mobile betting app dedicated to North American thoroughbred action. With all the various betting apps to choose from, bettors can also consult apps such as Oddschecker to compare odds across different bookmakers. The shift of horse racing betting to the mobile ecosystem does not come without its challenges. One hurdle encountered by bookmakers is Google Play’s longstanding ban on bookmaker apps in the United States, which makes targeting Android users more difficult. While Google Play does allow a host of betting-related apps to be downloaded from its platform, unlike Apple’s official app store it bans apps that provide a platform on which to bet. As a result, the likes of BetAmerica, Twinspires and Xpressbet have instead created mobile versions of their websites, which Android users can access through the browser on their mobile device. Regulatory hurdles aside, the growing popularity of horse racing betting apps in the United States is undeniable.